Time flies when you’re having fun, and I was quite surprised at how much time had flown since my last overhaul. The biggest issue needing attention was formatting—the site couldn’t be easily read on phones. Since fixing that meant rewriting all the code, it became the perfect time to freshen up the look. I hope you’ll find the site easier to navigate now no matter how you visit: via phone, tablet, laptop, or desktop. 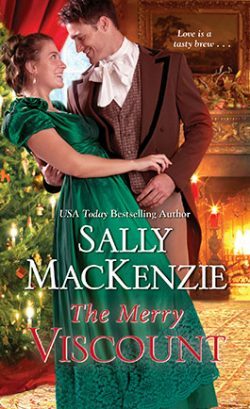 Most of the information here hasn’t changed—except I now have the cover for my Christmas book, The Merry Viscount. (Well, actually my September 24 book, but it’s Christmas themed—my first.) If you’ve read What Ales the Earl, you’ve met the heroine already—Miss Caroline Anderson. As the story opens, she’s coming back from London and an unsuccessful attempt to sell her ale, Widow’s Brew, to a tavernkeeper there, when two drunken bucks commandeer the stagecoach in the middle of a snowstorm and crash it just outside Viscount Oakland’s estate. The ton calls the viscount Lord Devil, but Caro knows him as Nick, her brother’s childhood friend—and her childhood crush. And guess what? In the course of writing this post, I discovered the book’s now up for preorder at most online bookstores! I’ll be posting an excerpt once copy edits arrive and I get through them, probably around the end of January or the beginning of February.